Square Knot. Used for joining ropes of equal thickness. It is also the knot used for tying bandages, as it lies flat. This knot is also known as a "Reef Knot". The working end is tied over the standing end, "right over left, left over right." The Sheepshank is used for shortening a rope without cutting it & to bridge the rope. Clove Hitch. Used for securing a rope to a spar as a starter knot for lashings, and for securing a line to a fixed object. Round Turn and Two Half Hitches. Used for tying a rope to a tree, securing a boat or making a rope fast to a spar. Bowline. One of the most useful knots that you can know how to tie.it is used to make a permanent loop at the end of t rope It has many other uses such as a rescue knot for hauling people up a cliff. You should practice tying this knot in the dark, and with only one hand. In addition to its use or starting a diagonal lashing, the Timber Hitch frequently is useful for hauling logs to the council fire, and for hauling spars and timbers for such pioneering jobs as bridge and tower building. It can be quickly adjusted, holds snugly under a strain, and is easily freed. The Fisherman's knot is used by fishermen to join strands of fishing line.it is used to tie two ends of the slippery rope It is one of the best knots for tying fine lines together, especially plastic or nylon. It is used two tie two ends of the rope of equal or unequal thickness. Ropes are made up of a number of strands twisted together. If the cut end is left un-whipped, the rope will fray or untwist, and loose strength. Being thrifty, Scouts, 'Whip' or bind the ends of ropes, this prevents fraying and prolongs the life of the rope. 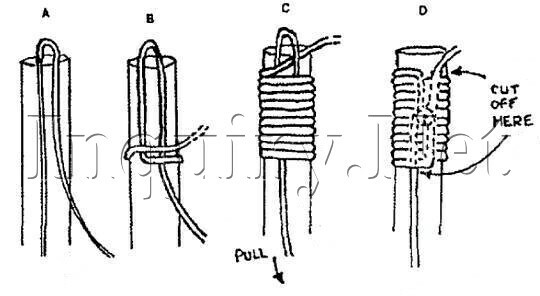 Lay whipping twine on rope to form a loop (Diagram A). Bind twine around to trap loop (Diagram B). Continue with neat, tight bindings until the length of whipping is equal (about) 3 times the diameter of the rope (Diagram C). Working end of twine should then pass through the end of loop (C). Pull hard on the other end of the twine so that the working end is drawn and trapped under the binding, (Diagram D). Cut off loose ends, roll whipping under foot. You should have a tight, neat whipping that will stop the end of the rope fraying.